Donald Trump tried to transform Atlantic City into a personal cash cow — and doomed the city in the process. In the spring of 1990, a grinning Donald Trump stood on a platform suspended outside his new Atlantic City casino, rubbing a golden lamp the size of a washing machine. The lantern fizzed with smoke and emitted two lightning-like laser beams from its spout, shooting into the sky to sever a ribbon draped over the forty-two-story Taj Mahal Casino and Resort. Trump — skinny and sporting thick brown hair — looks nothing like the plump, sunburnt, and bleached Republican presidential candidate of today. He had just consolidated his empire by the boardwalk; the Taj was his third Atlantic City casino, his biggest but also his last. By the time he announced his presidential bid, it was all in ruins. The Taj Mahal collapsed first, filing for bankruptcy just a year after it opened. Trump had financed the casino with millions in junk bonds, and hundreds of contractors went unpaid. Its $3.5 million cash reserve — a mandatory requirement of the Casino Control Commission — had to be delivered in a briefcase by Fred Trump, Donald’s father. Over the next twenty years, Trump’s company would file four more bankruptcies in Atlantic City as an overheated property market and rival casinos devastated his fledgling gambling complex. In 2014 alone, casino closures cost Atlantic City more than ten thousand jobs, a staggering figure for a city with a population under forty thousand. Atlantic City’s unemployment rate sits at almost 14 percent, and it suffers from the highest home foreclosure rates in the country. Donald Trump may herald a radical new force in American politics, but his background illuminates trends that have been unfolding in American cities for more than fifty years. As deindustrialization hollowed out cities’ economies, many have responded by wrapping their public spaces in glittering property developments and legalizing gambling to survive. While the media has dissected the failures of Trump’s casinos, the technicalities of their bankruptcies, and the shadowy financial means that propped them up, dwelling on their brief success reveals something more important, and indeed more terrifying, about what might happen if he wins in November. Atlantic City’s story begins during the 1854 railroad boom, when a local railroad company built a lonely spur from Philadelphia to the Atlantic Ocean and sparked the development of a small parcel of coastland that would become one of the East Coast’s biggest resort towns. In the nineteenth and early twentieth centuries, a network of vacation spots spread across the rapidly urbanizing American countryside, typically laid out along major railroad lines. The modern tourism industry was born in these places, as first middle- and later working-class people jumped at the opportunity to escape crowded and polluted cities. Places like Atlantic City or Santa Cruz walked the line between wholesome getaways for polite society on the one hand and anarchic centers of working-class sociability on the other. By the 1920s, Atlantic City’s economy and urban landscape was built on escapism. Its famously bawdy boardwalk hosted Italian, Greek, and Irish workers from New York and Philadelphia. Middle class voyeurs checked into upscale hotels like the Ritz Carlton. Labor Day weekends brought an estimated 350,000 people to town. 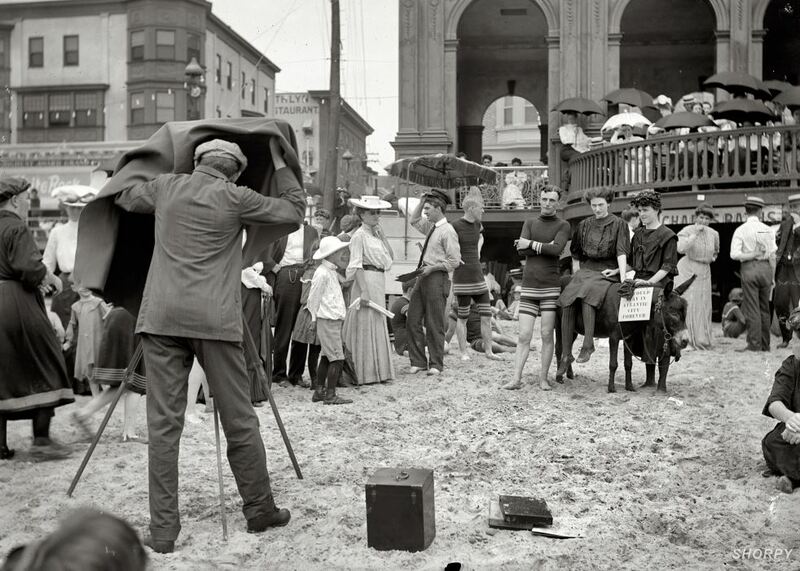 Beachgoers being photographed in Atlantic City, NJ circa 1912. Detroit Publishing Co. The boardwalk epitomized a particular kind of prewar public space where white middle- and working-class visitors mingled — a world of warm sandy seafood, speakeasies, and chance sexual encounters. 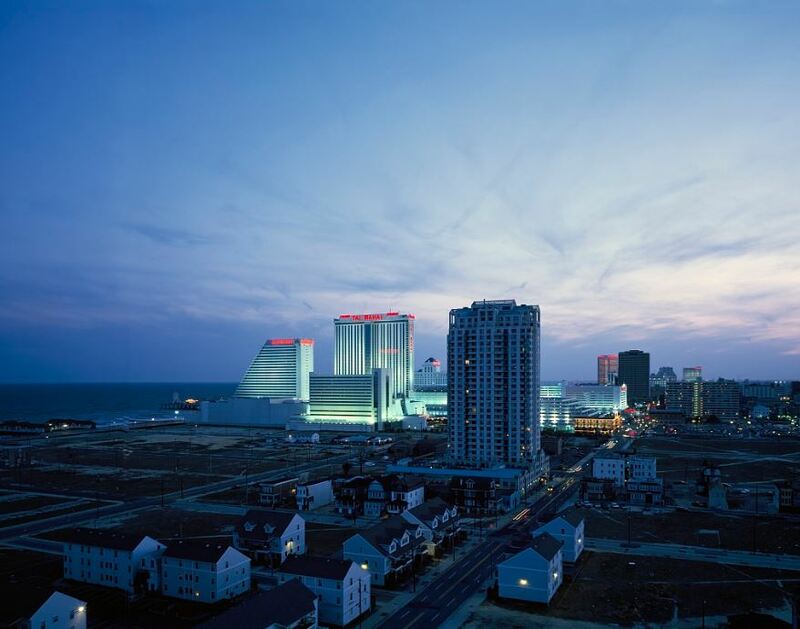 By the 1970s, Atlantic City fell prey to a kind of generalized urban crisis. Rising car ownership meant that vacationers who had once spent weeks in the resort would now stop for just a few days on their way up or down the East Coast. 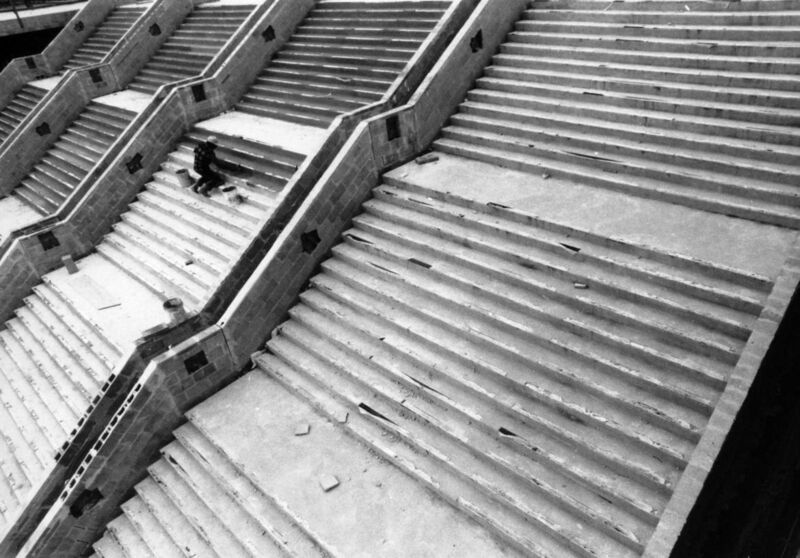 The city’s population plummeted, and the grand seafront hotels stood empty, facing demolition. Then the casinos came along. A handful of cities and states had introduced gambling as a solution to the budgetary crises of the sixties and seventies: New York City legalized off-track betting, and New Hampshire created a lottery. But Nevada remained the only state with casino gambling. New Jersey decided to get in the game. An initial statewide referendum to permit casinos was defeated. But in 1976 — after a campaign heavily bankrolled by a consortium of gaming interests — a second referendum approved the construction of a limited number of large hotel-casinos in Atlantic City only. North Jersey voters who were concerned that gambling would exacerbate social problems and increase crime were won over by promises that the Atlantic City casinos would bankroll the state. Under the referendum’s terms, 8 percent of gaming revenue would go to fund programs for senior citizens, and 2 percent would fund “community development” in Atlantic City. Two years later the city’s first casino opened its doors. This is when Donald Trump — who had spent the 1970s taking advantage of New York City’s fiscal crisis — entered the scene. On land bought from the Penn Central Railroad at fire-sale prices, and with vast tax abatements wrested from a desperate city government, Trump had built a chain of apartment complexes and hotels, earning a reputation as an oily celebrity booster. At this point three big casinos — Resorts, Bally’s, and Caesars — dominated Atlantic City’s skyline. The city, only recently a near ghost town, was flooded with gamblers from the across the East Coast. Its property market overheated, and crime rose 80 percent. Demand outstripped supply, and the city, desperate for more casinos, drooled at the prospect of a celebrity property developer. Like New York, Atlantic City bent over backwards to accommodate Trump. Trump Plaza opened in 1984, swiftly followed by Trump’s Castle in 1985, a Hilton hotel retrofitted into a casino. While these casinos did well, Trump yearned for more. A vast $500 million construction site — what would become the preposterous Taj Mahal casino, set to be the tallest building in the state — loomed over the city, overshadowing Trump’s meager developments. The project initially belonged to Resorts International, but when its owner, James Crosby, died unexpectedly during surgery in 1986, Trump saw his opening and purchased the half-finished property. It was lavish and debt-ridden, undertaken when casino revenues were already beginning to plummet. With the commission successfully conned, Trump immediately turned to the junk bond market, raising millions at a 14 percent interest rate — twice what he initially projected and more than he would ever be able to pay. The short-lived Taj Mahal Casino did to Atlantic City’s public space what firebombing did to mid-century Dresden. It was a city within a city, where tourists parked, slept, ate, and gambled, all without having to set foot on the streets outside. The casino’s 1,250 hotel rooms and 3,000 slot machines spanned seventeen acres of boardwalk. It required five times as many steel girders as were used to construct the Eiffel Tower. No expense was spared: $15 million on chandeliers, an interior smeared with so much marble that it consumed nearly two years’ worth of output from an Italian mine. But the Taj was a vast, hyper-capitalist mirage, an ornate window frame rotten to the core. The lightest tap and it fell apart. For any other businessman, this would be a story of comeuppance following epic hubris, a conspicuous career-ending catastrophe along the lines of Charles Foster Kane’s Xanadu. But the casino’s spectacular bankruptcy might merely be a footnote in the biography of a global demagogue. Casinos like the Taj Mahal have destroyed Atlantic City’s public space. Gambling’s arrival replaced the outward-looking hotels, shops, and promenades of the mid-century boardwalk with clusters of dark, labyrinthine resorts, set back from the street and enclosed behind monitored security gates. Many of these new developments are linked by private walkways suspended above increasingly immiserated streets. This is a rootless and anti-urban landscape, one that has hastened the destruction of nearby neighborhoods like South Inlet, which never reaped the benefits of the towering casinos nearby. Unsurprisingly, Trump himself played a central role in one of the biggest standoffs between casinos and residents, when he tried demolish an elderly woman’s home to make way for a limousine parking lot. As Trump lurches closer to the presidency, it feels apt that more and more American spaces look like Atlantic City. Many cities and states have legalized gambling rather than raise taxes — Iowa in 1991, Detroit in 1999, Philadelphia in 2010, and Cleveland in 2012. These developments produced Atlantic City’s present fiscal apocalypse: why go to Atlantic City when Atlantic City has come to you? 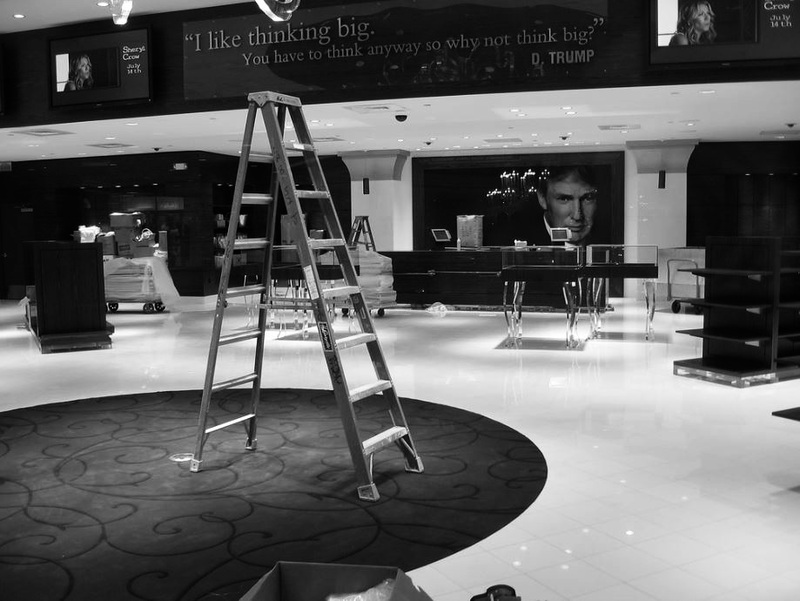 Even where gambling is illegal, American cities’ postindustrial landscape is littered with shopping malls, gated communities, and glittering convention centers. Atlantic City’s model of a plush, self-contained casino abutting a ruined neighborhood has become a synecdoche for the last forty years of American urban development. As a high-profile pioneer of this new kind of city — responsible for changing how urban spaces look and feel — Trump’s candidacy marks its coming of age: fortified, privatized, relentlessly white, offering a frenzied, speculative, and ultimately false model of social mobility, and set behind a giant, thick wall. One can’t help but think that Trump’s Atlantic City casinos are the inspiration for his candidacy, a window into how a Trump presidency would shape the country’s future.